A chart with keys and chords showing the relationship of chords in all the keys can be seen below. From left to right you can see a key and the chords that belong to it. 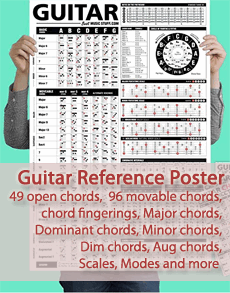 If you are looking for an overview of guitar chords, see the chart with diagrams. In essence, the table gives tips on which chords to play together. Chords on the same rows will always sound good in different progressions because they belong to the same key. See also an expanded version of the chart below. The chord chart above is very useful because it tells you which chords that belongs to a certain key. As soon you know this, you also know which chords that are well played together. Really nice and smooth, isn’t it? Of course, sometimes we want some dissonance in our music but the chart above gives us the fundamentals for creating chord progressions. One more area in which the chart can assist us is in writing our own songs. As we recognize chords that working together, we can use them together then composing music. For the other keys, use the table above. For more instructions, see the article about chords that sound good together. This second table gives you some possibilities beyond what is presented in the first table. One example of chord progression using the expanding chords in the key of G is G - A - C - D.
You could even add a third chord beyond the standard key chords: iiimajb. In the key of G this would be Bb. One example of chord progression is G - Bb - C - D.
There are more categories of four-note chords, but these are suggestions of chords that fit well together. For example, it is common to use a seventh dominant as the V chord. Whenever a chord is marked with a 7th, you could always substitute it with a 9th, an 111th or a 13th chord. Following the same concept, a m7 or a maj7 chord could as well be substituted with a m9, maj9 and so on.